Traveling with lighting equipment can be challenging. While it is easy to swap out large studio lights for small strobes and there are many lighting accessories for small strobes, there is still the need to travel with light stands. Light stands tend to be long and difficult to pack, with very few options available to be transported as carry-on baggage. For the past four years I have happily carried my light stands on-board flights with me. My light stands are sometimes in the bag I am using, and more often than not attached to the outside of the backpack I am wearing. These rugged, compact-yet-full-sized, light stands are the Manfrotto 3373. What makes the Manfrotto 3373 light stand ideal for the traveling photographer? For starters the 5-section light stand folds down to a compact 19.3″, yet extends up to a maximum high of 6ft 2″. At a lightweight of 2lbs the light stand can comfortably hold 4lbs. Working in right spaces with compact lights is easy with the 3373 having a maximum footprint of 3ft 3″. Each of my lighting kits has it’s own set of Manfrotto 3373 light stands. I keep three in my LowePro Pro Roller II case that contains two Lumedyne heads, a Nikon SB-28dx, power pack, two batteries, set of Pocket Wizards, cables, soft-boxes, grids, etc etc. This full-size studio kit fits in a single checked bag that weighs a mere 48lbs. For the rest of my lighting needs, I keep an additional three Manfrotto 3373 light stands. The three Manfrotto 3373 light stands that are not packed with my Lumedyne kit are used in a variety of set ups depending on my needs. The compact size of these light stands allows me to insert them in the outside pocket of most backpacks and secure them using the backpack’s compression straps. While I frequently travel with a single light stand for many shoots, the design and size of the Manfrotto 3373 allows me to easily stack two together and travel with me inserted in a backpack’s external pocket, secured by the bag’s compression straps. I have frequently stocked an entire mobile studio kit inside the compact Mountainsmith Parallax backpack, thrown two light stands on the outside of the bag and hopped on a flight. Earlier this year in 3.5 days I flew through 5 countries (shooting in 4 of them) on three continents, crossing the Atlantic and Pacific Oceans, with a Manfrotto 3373 attached to the outside of my North Face Surge backpack. Quick shoot down in Philadelphia? Pack up a Mountainsmith Day pack and attach the light stands to the securing straps to the bottom of the bag, or in the side pocket and use a carabineer to secure the stands to the shoulder strap. Fearful of the lightweight light stand tipping over with some wind while shooting outside? There is a simple solution, I often stop by a shop such as Home Depot and pick up a few US$2.00 cinder blocks to toss on the legs when using full-size lights. When using small strobes, such as the Nikon SB-28dx Speedlights I simply place my bag on one of the legs to weigh it down. As for flying with the Manfrotto 3373, the ultra compact size of the light stands draws virtually no attention to its self. As the light stand is smaller then international carry on restrictions, airport security almost never questions the light stand being attached to the exterior of the bag. The light stand attached to my bag has only once been questions by an airline……..and that was a United Airlines flight attendant whose hobby was photography. She wanted to know what light stand I had attached to my bag. The more I travel, the more I shoot environmental portraits on the road, the more I grow fond of the Manfrotto 3373. 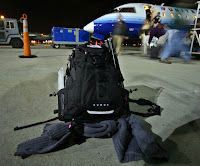 Below are a few photos of the Manfrotto 3373 at work and packed as carry-on for work. Photo #4 : A single 3373 light stands attached to my Mountainsmith Day pack. Photo #5 : A single 3373 lashed to the bottom of my Mountainsmith Tour. I have two of these stands that I bought mainly for travel photography. One benefit I haven’t heard anyone mention is that the legs can go down flat, so one or two of them can go under furniture which has proven nice in small offices, for example.